The third add-on to Shadow of the Tomb Raider. In The Nightmare, Lara Croft returns to her family estate and visits another tomb, where she has to face not only numerous traps and riddles, but also known but changed adversaries. This is Shadow of the Tomb Raider expansion pack. 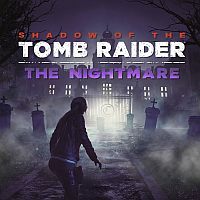 The Nightmare is the title of the third (after The Forge and The Pillar) DLC to the action adventure game entitled Shadow of the Tomb Raider. Just like the basic version of this production, the add-on was developed by Eidos Montreal studio. In Shadow of the Tomb Raider: The Nightmare Lara Croft returns to her family estate. The protagonist intends to know the secret of another tomb, whose confidant until now was Uchu known from the basic version of the game; besides, the woman has to face the demons of her past. The realization of this task will allow the fearless Croft to lay his hands on a mysterious, powerful weapon. As mentioned above, Shadow of the Tomb Raider: The Nightmare introduces a new tomb in which, in addition to the puzzles waiting to be unraveled, Lara meets well-known opponents; however, they behave in a completely different way than the enemies she has dealt with so far. As a reward for dealing with the challenges awaiting her, the protagonist wins the costume £uski Q, an axe called The Gorge of Fear, and the ability of White Breath, thanks to which the anxiety arrows used by her act in an area. The Nightmare is a non-self-reliant add-on, which requires a basic version of the game to work.